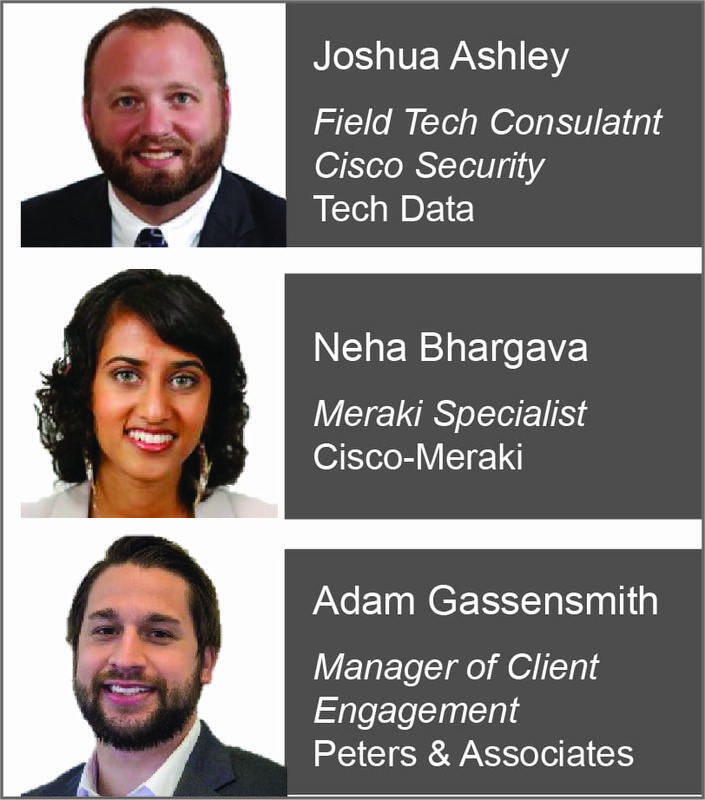 We were hon ored to have Joshua Ashley, Neha Bhargava, and Adam Gassensmith speak at Peters & Associates’ Cisco Lunch Seminar: Security & Wireless for Business. The discussion focused on how to monitor and respond effectively to security events. Topics ranged from organizational preparedness to how specific Cisco and Meraki products can protect your business. While ransomware remains the most common malware threat for business, impersonation tactics like spoofing and targeting scams like spear-phishing, have subverted traditional security controls. Gray mail is a new type of attack which uses familiar email offers, like Best Buy coupons or weekly deals, and hides the malware in the unsubscribe button. Since everything else on the webpage operates like a regular email offering, end users are convinced that the unsubscribe button is also operating normally. These new attacks reinforce Joshua’s assertion that there needs to be a new approach to cybersecurity for organizations. No amount of moat building can completely protect against confidence tactics like spoofing, gray mail and phishing. While that initially sounds pessimistic, this change in approach represents a huge opportunity for companies worried about cyberattack. Instead of searching the market to find a silver bullet solution to protect against any possible security event, cybersecurity should be a constant process of evaluating potential threats, knowing how they affect your business, and finding ways to mitigate them. This requires a commitment to both understanding the constantly evolving cybersecurity landscape, and continually educating your employees on best security practices. Unfortunately, good practices are not useful without a strong knowledge of the security of your overall network. You must understand the capabilities of individual solutions and software but also understand how to best respond to cyberattack. Thinking about your technology infrastructure as three main components–People, Technology, and Procedures–can help in mapping organizational responsibility. In addition, having a written plan is vital to being able to respond effectively. Adam also emphasized using the NIST cyber security framework, and its five central functions: Identify, Protect, Detect, Respond, Recover, to create an effective, actionable plan. Peters & Associates can help your business to develop and implement a cybersecurity plan. We offer managed services that include security activities like firewall monitoring, firewall patching, firewall reporting, and security testing, among others. Cisco Meraki does a lot of things well. It offers cloud support for all its networking products, which offer complete solutions right out of the box. Meraki has the bestselling access points on the market. It continually updates its devices, giving users additional functionality even after the initial purchase. The real competitive advantage, though, is in its dashboard interface that allows users to monitor all their equipment, systems, and people. Neha demonstrated that the dashboard makes it easy to find disruptions in the network, track activity (even on security cameras), and protect against security threats. Aligning Meraki solutions with your security goals is a great way to begin to secure your business. Thanks to all who attended the event and check out peters.com for upcoming events and IT webinars. For more information on how to develop, implement, and improve your organization’s cybersecurity practices, or how to deploy and support Cisco and Meraki products, contact us at info@peters.com.